Meaning Long live the Republic! Usage notes: Vive la République is a companion expression to vive la France. While the French generally use them together (mostly during political rallies, as in the video below*), Francophiles of other nationalities only say the latter. But what’s the difference? As you may know, there are several different names for France. La France is of course the general term, encompassing everything from the country’s geography to its culture. In comparison, la République refers to the government. After the French Revolution, France changed from a monarchy to a republic. It continued evolving through empires and different republics until the current incarnation, la Cinquième République (the Fifth Republic), was established in 1958 by Charles de Gaulle by constitution. ** When the French refer to their country as la République, they do so with pride in their modern system of government. 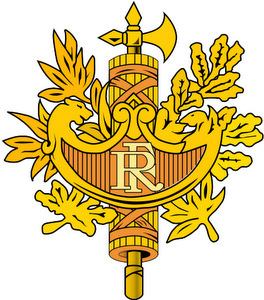 In the image above, RF stands for République française. Next Allez les Bleus !